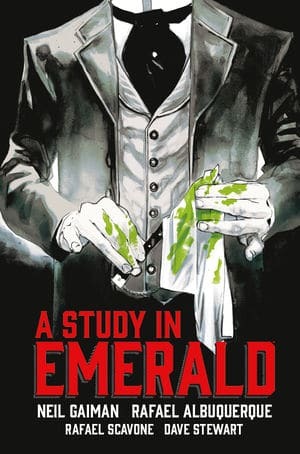 Neil Gaiman’s A Study in Emerald: Holmes falls to Cthulhu in the most unexpected of ways, and it is simply brilliant. What does Sherlock Holmes really stand for here, good or evil? Simple as the question posed the story yields only the most intriguing and complex mystery as its answer. An all-star lineup comes together to bring a Neil Gaiman world, a Sir Arthur Conan Doyle world and then drop them into an H.P. Lovecraft Cthulhu world. The artwork could not be better used to craft the incredible world in this tale. 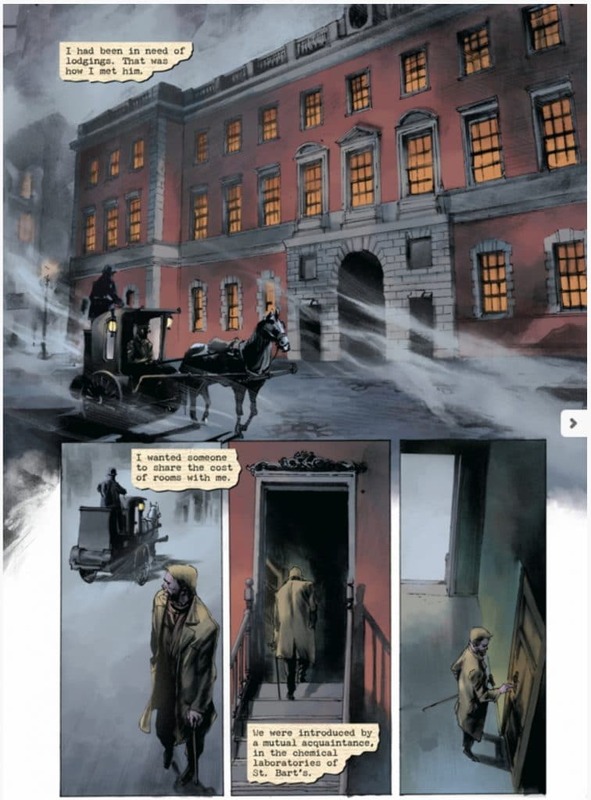 The 19th Century, the blood patterns (bright green too), the English gray tones, the wallpaper, and the sharp, poignant characters come to life in a unique and enticing fashion. This fantastical detective mystery has so much more than meets the eye going on. We start at the beginning of the Sherlock Holmes mythos and Holmes meets John Watson in the world of Baker Street looking for a roommate for the London flat. The tall Holmes is very familiar, as is the shuffling Dr. Watson. Yet something is eerily different and out of place too. That said I read the depiction of Watson’s war injury, from a Cthulhu-like kraken while he was at-sea in the Queen’s Army, and I completely failed to notice the near-standard 19th century sea-monster from the hidden depths of the volatile world was, in fact of the tale, a real Cthulhu. I had entered a vastly darker Lovecraftian world and it had robbed the good doctor of his crack-shot ability by sucking life out of his shoulder. This would only come back to me, like a splash of cold water on a sleeping face, at the finale of the grand tale. In the dark mirrored world of H.P. Lovecraft – that is so close to our own and yet so starkly different and dark – the perpetrators of the tales’ main mystery, the prince’s murder, were never caught. And though Holmes and Watson do uncover and even meet in-person the two wholly ruthless villains, foils of our heroes, one cannot help but wonder if the murderers – the tall actor and the shuffling doctor with his walking stick and his devious ability to wage medical knowledge as a war on anatomy – if they were not the mirror dimension of some H.P. Lovecraft multiverse: an evil Holmes and Watson! But then that bears its own questions of good and evil and over-simplicity. Lovecraft’s fear was sometimes best induced by building a world that reflected our own but just produced physical monsters to encompass real world troubles. And in A Study in Emerald the Cthulhu beings are a mystery! The wild one may have forever maimed Watson and yet the leaders of the world and the Queen Victoria of England Cthulhu has gone ahead and healed Watson upon meeting with the sleuths for hire. The world has been ruled over by Cthulhu figures for hundreds of years. The dynamic of pre-WWI era tensions – once called The Great War – are very apparent in the story, just in subtle ways. As Holmes speaks to Inspector Lestrade of possible motive for the Prince Cthulhu’s murder, he talks in admiration of the anarchists: those who see the powerful Cthulhu leaders are feeding off of humanity’s pain. And the anarchists feel humans are best left to ourselves, where chaos rains. In the real world, this was indeed a sentiment shared by anarchists around that time. And the terrorist-anarchist groups committed violent acts that shaped the world and its tension leading up to the first World War. Back to the tale: a comically round version of Lestrade is exasperated by Sherlock’s blasphemy. And Holmes, who seemed to know the Queen Cthulhu of England personally, is clearly sided with the crown’s rule and prosperity, despite his understanding of the motive. This possibly points to Holmes and Watson as being the villains upholding authoritarianism in the tale, while the terrorizing murderers only committed their evil act out of hope for a cause that even Holmes seems to admire as a noble one, if not misplaced with violence. The question of the age and the foils of the Cthulhu world Holmes and Watson are best left to our imaginations . . . for now. Unless, of course, Mr. Gaiman and co. takes us back to this bizarre and riveting world again! Ask your LCS for a copy of this marvelous hardcover from Dark Horse comics; I know Red Shirt Comics will get you one! “Neil Gaiman’s A Study in Emerald: Holmes Falls To Cthulhu” was written by R.J. Huneke.